At Frankfurt Book Fair, which will be held from 8 to 12 October 2014, PocketBook will show its new products and represent wide range of product customization for b2b audience. Visitors of Frankfurt Book Fair will see new PocketBook Sense with Kenzo cover – the new premium 6" E Ink e-reader with an in-built light sensor for automatic frontlight adjustment. The e-reader is released together with a cover designed in collaboration with Kenzo fashion house. Multimedia fans will have an opportunity to see and test PocketBook SURFpad 4 product line, which consists of three tablets. Every of three models is equipped with an octa-core CPU, the maximum set of multimedia features, including 3G, GPS, Bluetooth 4.0, dual-band Wi-Fi and runs under Android 4.4. Also the earlier announced models will be exhibited: PocketBook Ultra - world's first E Ink e-reader with a built-in camera and PocketBook InkPad - 8" a premium E Ink e-reader with a maximum in-class screen resolution. In Germany PocketBook InkPad will be represented with preinstalled English-German and German-English dictionaries from the leading Dictionary Publisher - Langenscheidt. 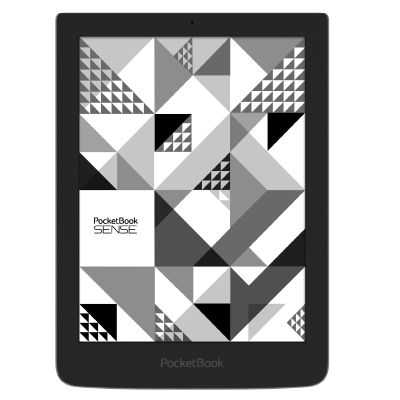 PocketBook as the 3-d world’s largest manufacturer of E Ink readers delivers not only the high quality and innovative hardware, yet, also the best software solutions for the e-reading market. Today PocketBook has up to 20 b2b projects in Germany, France, Italy, Switzerland, Poland, The Czech Republic and other countries. The visitors of Frankfurt Book Fair will have an opportunity to get full information about customization possibilities, which help PocketBook partners worldwide to deliver the e-content to e-readers in the most convenient way. PocketBook offers a wide range of product customization alternatives. One of them is redirection to partner’s on-line book-store via special browser, or even a separate customized application, developed specially for the partner’s content-store and preinstalled on e-readers. This feature gives exceptional comfort of buying the content to the end-user. The partner may order a deeply customized interface or customized device look (branded packaging and splash-screen, logo on the back side of the device). Another opportunity is PocketBook sync., which allows the end-users synchronize the content bought at on-line book-store with their devices via Wi-Fi. One of the latest PocketBook customization developments is PocketBook Push Service - a service which sends notifications about newest content in book-store to the users. PocketBook B2B customization, including branding, UI improvements and web-store integration, offers booksellers the most comprehensive and competitive solution for booksellers to gain a foothold at the e-book market. Visit PocketBook stand at Frankfurt Book Fair (Hall 4, place B 30) and get the latest information about new PocketBook devices and variety of B2B solutions from company’s representatives.